And, while this has surely been an ornery winter, like the light at the end of the tunnel, spring is right around the corner. 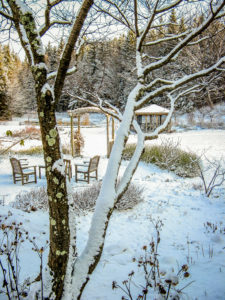 Winter began in earnest in 2018 when, at the beginning of January, we had bitterly cold weather dropping below minus 20℉—and almost no snow. Since deep snow actually helps by insulating the ground, I worry that this one cold snap could have damaged the roots of particularly vulnerable perennials— I will find out when spring arrives! Then a very warm spell in February started the maple sap flowing, and everyone was predicting a really early spring. But that turned out to be an illusion. As we passed the Spring Equinox with the sun riding high across a brilliant blue sky, once again nighttime temperatures were dropping below 0℉. And, after three successive nor-easters, the snow in my garden was almost three feet deep. But enough of my grumbles—I am ever the optimist! No spring skips its turn: the buds on the serviceberries outside my kitchen window are starting to swell and in a few short weeks the wood-frogs will be croaking in the pond—a signal for me to head outdoors to enjoy the flowers of spring. Nothing beats walking through the woods in springtime. As the sun shines through the leafless trees it warms the soil, triggering a profusion of wildflowers as far as the eye can see. Around my home, as in much of Vermont, the woodland soil is predictably acidic, which perfectly suits many of our loveliest spring wildflowers, including Spring Beauties (Claytonia virginica), Trout Lilies (Erythronium americanum), Bellflowers (Uvularia sessilifolia) as well as the Red and Painted Trillium (Trillium erectum and T. undulatum). And I am always delighted when I find sizable clusters of Squirrel Corn (Dicentra canadensis) and its close relative Dutchman’s Breeches (Dicentra cucullaria), where the little flowers dangle from the stem like laundry hung out to dry. I will also be watching for some less-common beauties, including Bloodroot (Sanguinaria canadensis), Goldthread (Coptis trifolia), and Starflower (Lysimachia borealis). And, if you drive the back roads in the limestone regions of state, be sure to watch for vast colonies of Large-flowered trillium (Trillium grandiflorum)—their pure-white flowers are truly an unforgettable sight. 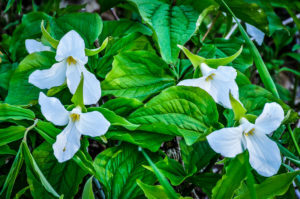 Since Large-flowered Trillium prefer an alkaline soil, they are picky about their location; but in the right spot they seem to multiply without end. White trillium spreading as far as the eye can see along a backroad in Salisbury, Vermont. 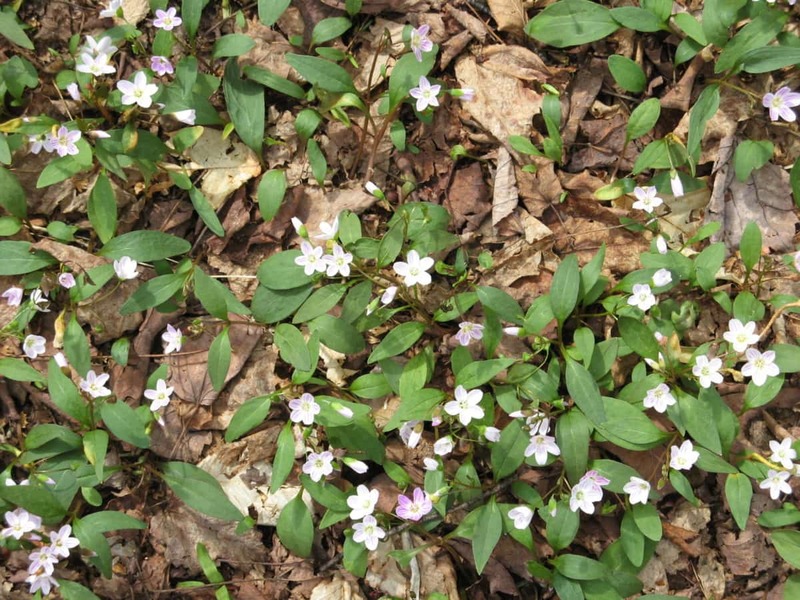 In late April and early May Spring Beauties(Claytonia virginica) carpet the forest floor in Vermont But once they have flowered and distributed their seeds, they vanish below ground until next spring. 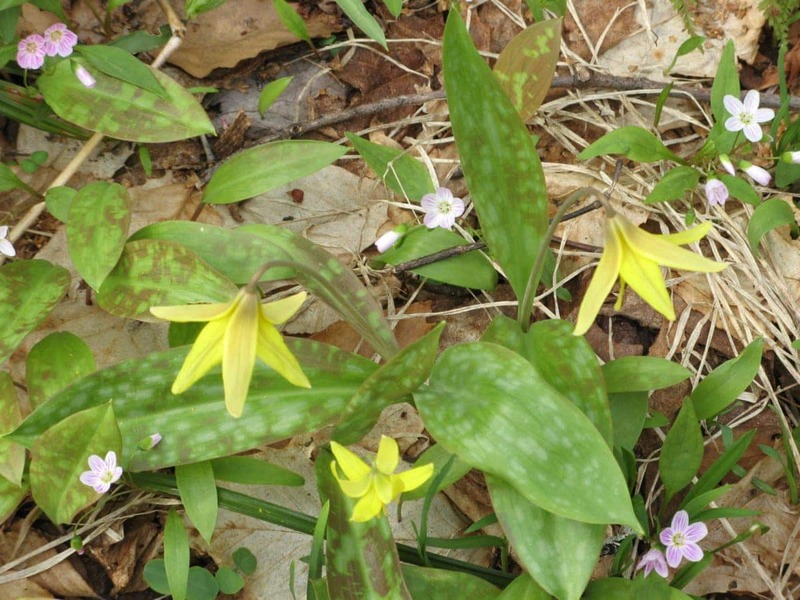 Many of our earliest woodland wildflowers like Spring Beauties,Trout Lilies, Squirrel Corn and Bellflowers are truly nature’s opportunists. 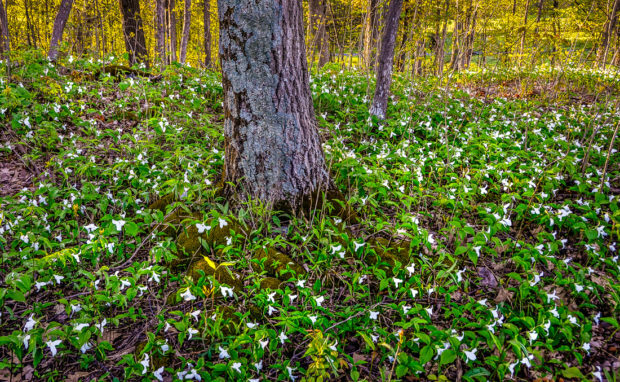 Known as spring ephemerals, their annual emergence is precisely timed to coincide with that brief window in late April and early May when the ground has thawed but before the trees have fully leafed out, and the sun still illuminates the ground. In just a few short weeks spring ephemerals complete their entire annual cycle—from flowering to setting seed, as well as manufacturing food in their leaves (via photosynthesis) and storing it in their roots. Once this cycle is complete they vanish below the ground until next spring. Other spring wildflowers, notably Dutchman’s Breeches, Bloodroot, Trillium and Jack-in-the-pulpit, are partially ephemeral. After flowering their leaves will last awhile before dying back, but eventually they too will disappear from sight until the following spring. We have nature’s opportunists in our gardens too! Most notably, our common bulbs—snowdrops, crocuses, daffodils, tulips and many more—are all spring ephemerals. So plan accordingly: to avoid empty patches in your beds during the summer months, be sure to position other perennials around the areas where ephemerals grow. 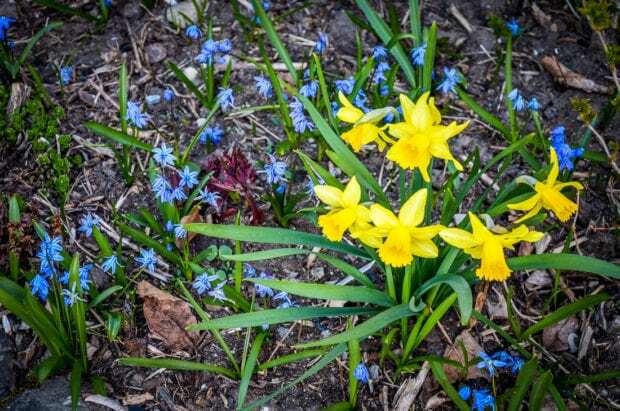 You can also use the short interval after the flowers have faded, but while their leaves are still green, to move some of your bulbs to new places and thus expand your spring extravaganza for the years ahead. I have used this technique to gradually relocate many of my daffodils to the rough grass along our roadside and at the edge of the woods. Here their leaves can mature without disturbance in the long grass before finally going dormant in July. White seems the perfect color to welcome a New Year in the garden. And fortuitously there are plenty of glistening white flowers to help us do just that. About 15 years ago I decided to clear our ‘barn slope’ and plant a garden. Little of interest grew there, apart from one tiny patch of Bloodroot (Sanguinaria canadensis) which, each April, miraculously pushed its way through the thick ferns and grasses. Carefully I harvested some pieces of rootstock and tucked them into various shady corners of my garden. They did indeed exude a reddish liquid somewhat reminiscent of blood and I believe to this day Native American basket weavers like to use it as a dye. Now every April I am rewarded as swaths of pure white flowers with yellow stamens suddenly emerge from the bare earth. 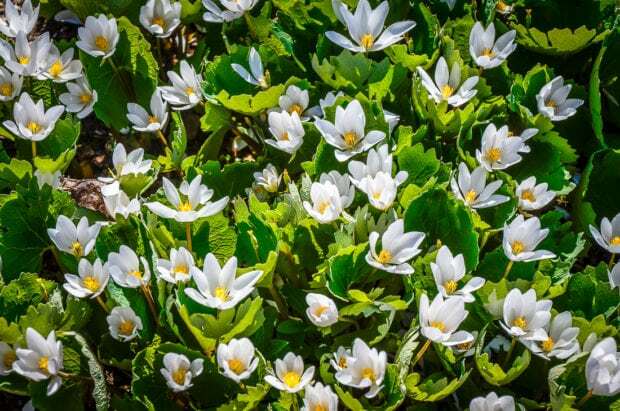 Bloodroot is actually semi-ephemeral often keeping its scalloped leaves throughout the summer. Then I nestled approximately 50 snowdrop bulbs across the newly-cleared ‘barn slope’. 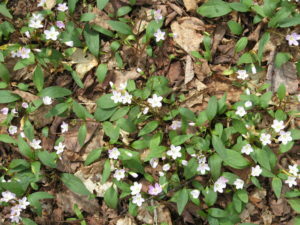 Soon each little bulb became a small colony and now, every April, the whole slope is covered in dainty white flowers. 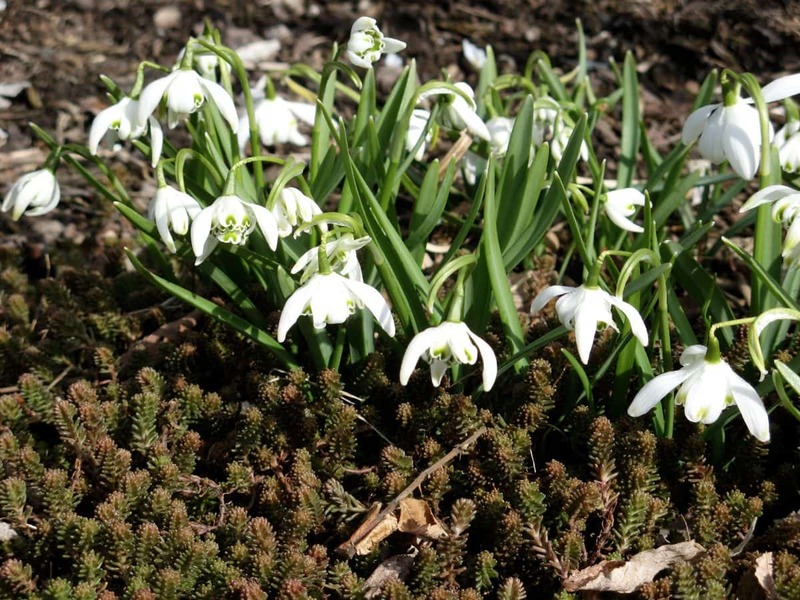 Snowdrops originated in Europe and Wikipedia will tell you they typically flower before the Vernal Equinox. 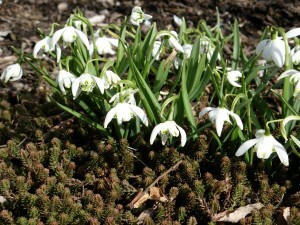 However here in Vermont they postpone their flowering until the snow has gone and the spring sun has warmed the ground. About a mile north along our mountain road there was an old farmhouse where, each spring, a mass of snowdrops emerged through the rough grass beneath the lilac bushes on the corner of the house. Over the years the house gradually fell into disrepair until finally the new owners decided to demolish it. Like our house, it had been built about 1850, and I was sad to see it go. But still the snowdrops return each year, creating a small remembrance of the many people who enjoyed that house for so long. Summer snowflakes, Leucojum aestivum, grow alongside our pond. And, despite their name, they actually flower in springtime!! 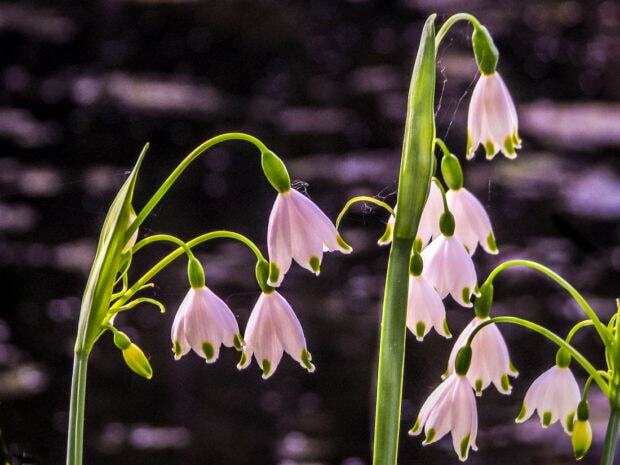 Snowdrops have a lovely but lesser-known relative (also a member of the lily family), the beautiful Summer Snowflake (Leucojum aestivum), shown in this photograph. Like snowdrops, they too have glistening white bells on delicate stems, but Summer Snowflakes are quite a bit taller— a foot or more high. And, despite their name, Summer Snowflakes do actually bloom in the spring! 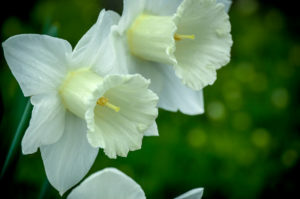 And finally, if you like to welcome spring with pure white flowers, there are several varieties of white Narcissi, including the large-flowered Mount Hood and the fragrant ‘Tardiva’. I am also very partial to one called ‘Salome’, with subtle peach-colored trumpets offsetting its outer ring of white petals. Jonquil narcissi surrounded by clear blue Scilla. If you look at an Artist’s Color Wheel you will see that blue and yellow appear on opposite sides of the circle, telling us that, when these colors are put together, the result will be a strong and pleasing contrast. I often use this idea as I think about which flowers will combine well together. And, in my mind, nothing beats clumps of yellow Jonquil Narcissi amongst a sea of bright blue Scilla. Although the actual flowers of Scilla are quite small they make up for it in sheer numbers by self-seeding. 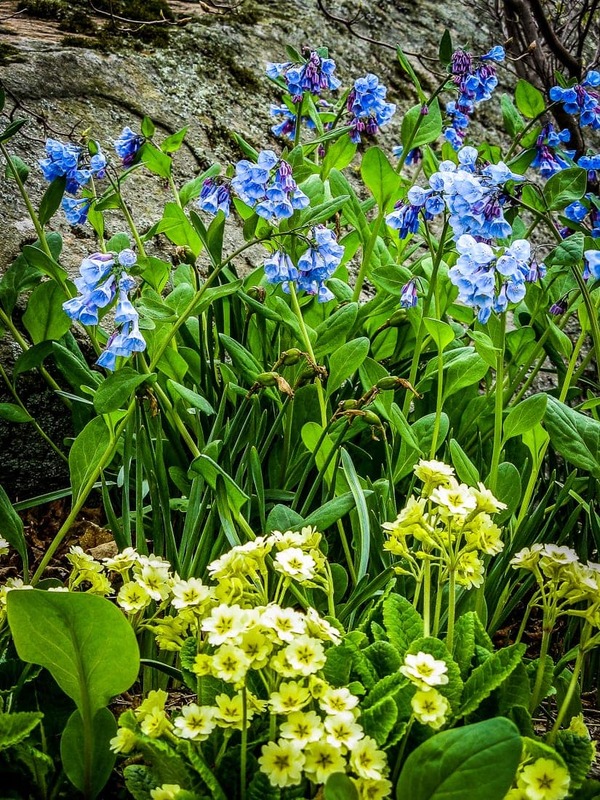 And, for another great blue/yellow combination, plant a few Virginia Bluebells (Mertensia virginica) among some clumps of yellow English primroses (Primula vulgaris). 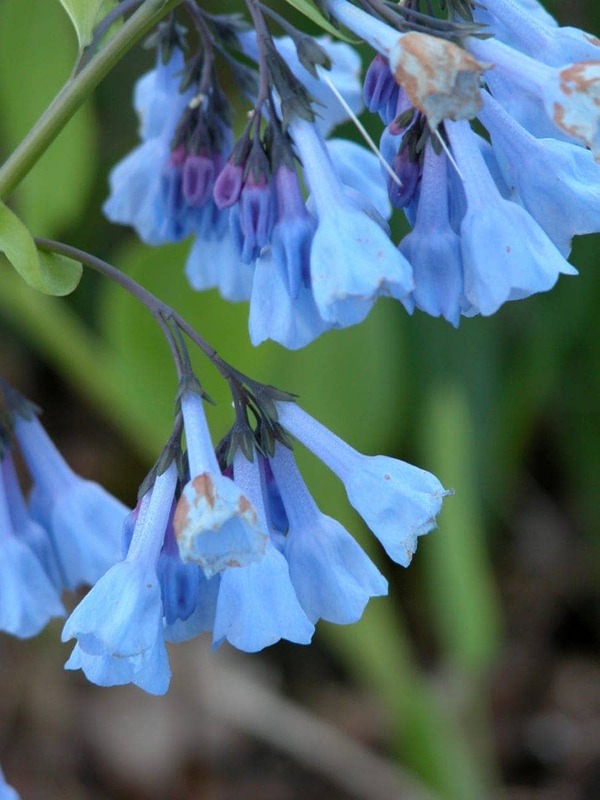 Virginia Bluebells are native to damp spots in the eastern parts of the United States, and, given similar conditions in our gardens, they will also spread themselves around by self-seeding. Their beautiful blue flowers are like nodding bells on 18 inches stems. 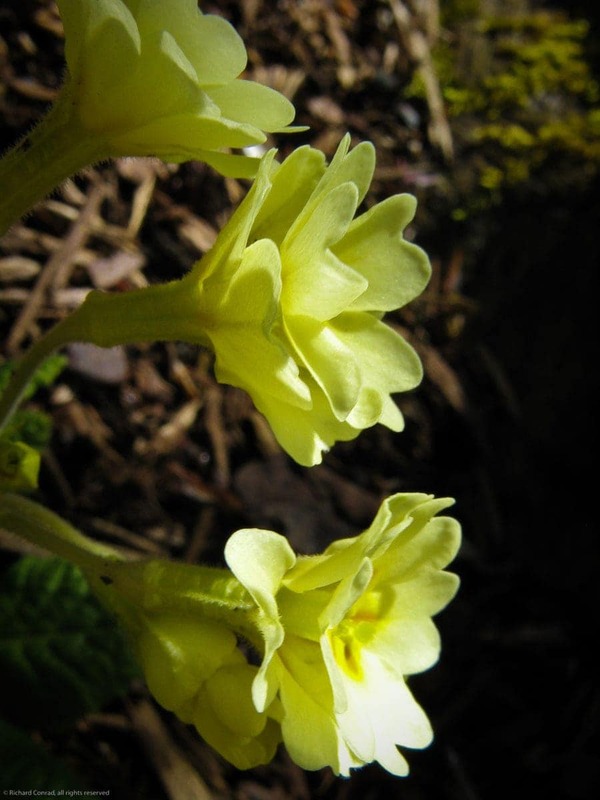 They are true ephemerals; once they have finished flowering the foliage gradually yellows, a signal you can replant pieces of their roots in new places to enlarge your collection. English primroses used to grow wild in the woods around my childhood home in Kent, England and they still hold potent memories for me. 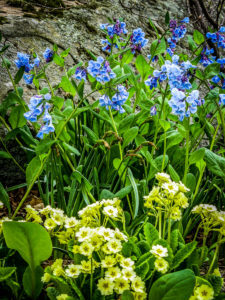 Since their crinkled leaves persist all summer long, by planting them in combination with Virginia Bluebells I avoid those annoying empty spaces later in the summer. 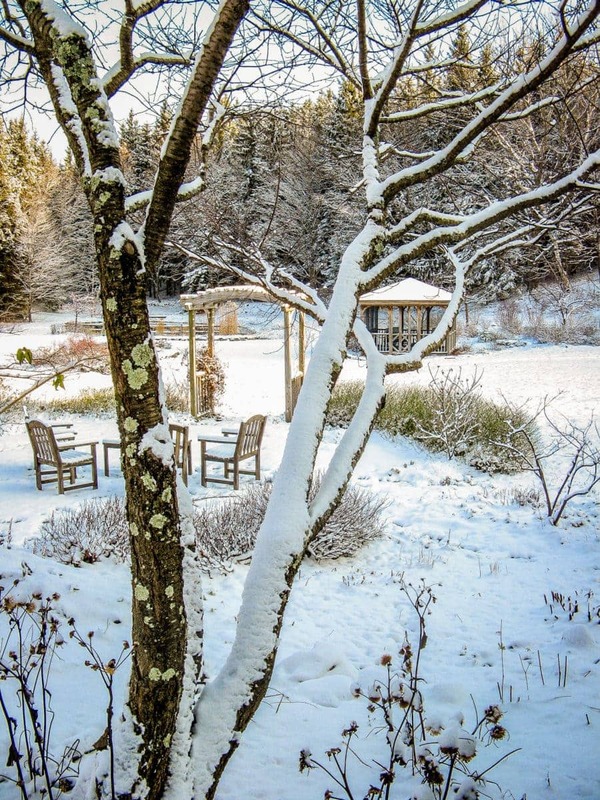 So as this long winter slowly by surely comes to an end, it is time for us all to savor the New Year in our gardens.